A member of the National Speakers Association, Mr. Modem (Richard A. Sherman) is well known in speaking circles as a technological humorist. He has presented more than 500 "Bringing Cyberspace Down to Earth" seminars and keynote addresses, has appeared on more than 400 radio and TV talk shows, and creator and host of the "Mr. Modem Minute" on FOX-TV. A nationally syndicated columnist, his Ask Mr. Modem! column appears in more than 300 publications throughout the U.S. and Canada. 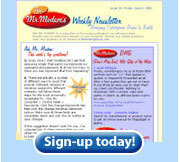 As publisher of the wildly popular, always entertaining Ask Mr. Modem weekly newsletter, his vast knowledge of the Internet and computers, coupled with his unique sense of humor, help provide easy-to-understand, non-technical, computer and Internet answers to questions received from subscribers now in 38 countries worldwide. The author of eight books, Mr. Modem's Internet Guide for Seniors was named "Internet Book of the Year" by the Independent Publishers Association and heralded by ABC Radio personality Paul Harvey as "the book that takes the gobbledygook out of computers." His most recent book, Ask Mr. Modem! is a collection of hundreds of frequently asked computer and Internet questions received from readers of his books and columns. Richard (Mr. Modem's alter ego) is President of Phoenix-based Get-the-Net, Inc, and is a member of the Advisory Board and featured content provider for the GE Center for Financial Learning. An Internet pioneer, Sherman first ventured onto the Internet in 1988, and as "Mr. Modem," has been providing an online helping hand to millions of computer users worldwide ever since. © 1998- Get-The-Net, Inc. A Mighty Interactive Production.